In light of the ongoing reports of destruction of heritage in the Middle East, Heritage for Peace would like to reiterate that it is not our purpose here to verify the reports referred to in this newsletter. Whilst we acknowledge the concerns posed regarding unverified information, the collation of such information serves to aid understanding of the conflict, and the motivations and priorities of the participants (both military and civilian), potentially aiding in finding solutions. In addition, it assists those who do verify such information and conduct damage assessments by providing comprehensive data, in order to aid stabilisation, damage mitigation and, future restoration and reconstruction. We would like to stress that whilst some of our reports are received from people on the ground, they are volunteers, and their safety is our first concern. Furthermore, whilst the ethical importance, and propaganda value, of raising awareness has also been debated, all heritage destruction should not pass unremarked, either by the public or the professional heritage community. We feel that the importance of heritage is fundamental to all humanity: its loss is a tragedy, and in acknowledging this, we pave the way to develop shared strategies for its protection. European Parliament discusses Syrian heritage. Last month a journalist interviewed Heritage for Peace, and then, in his article in the Economist, accused Heritage for Peace of training jihadi’s. Despite writing to ask for an official retraction, Heritage for Peace are disappointed that they have yet to recieve a reply. We have just contacted them again, and hope to receive a prompt response. However, we would like to formally state that the accusation that we train jihadis is both incorrect and offensive. In addition, the article stated that the Mr Tiejgeler ‘has re-employed 150 former antiquities officials who worked in the two-thirds of Syria that is now rebel-held.” They have not been employed by Mr Tiejgeler. The NGO has agreed to work with them on certain projects: Heritage for Peace are their partners, not their managers. Given the severity of the situation in Syria, it is disappointing to see the quality of the reporting. We wish that the journalists would devote more care such a serious topic. Heritage for Peace’s work is featured in a 10 July 2015 story on Palmyra in National Geographic Magazine, Syrians Race to Save Ancient City’s Treasures from ISIS. The work of HFP is featured in a June 25 2015 piece in the Argentine paper La Nacion, Arte por armas: el saqueo arqueológico, otra fuente de financiación para EI. HFP is featured in a CNN report from July 19 2015, Saving Syria’s ancient past from ISIS, (although readers should note that the report contains several innacuracies about HFP’s work). A comprehensive report on damage to Palmyra between February 2012 and June 2015 was released by APSA and the ASOR Syrian Heritage Initiative on June 29 2015. It can be downloaded in English here, in French here, and in Arabic here. Reports that airstrikes may have damaged the thick northern wall running alongside the Temple of Bel-Shamin, according to the Telegraph. 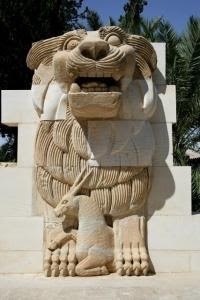 Reports that IS has destroyed the famous statue of a lion from the Temple of Allat at Palmyra. It is not clear when this statue was destroyed and indeed reports of this act had circulated previously. However, the DGAM told AFP “IS members on Saturday [27 June] destroyed the Lion of al-Lat, which is a unique piece that is three metres [10ft] tall and weighs 15 tonnes”, and confirmed it on their website (although there are discrepancies in the date). The destruction of two shrines, demolished by ISIS: that of Sheikh Mohammed Ali, and that of Abu Behaedinne, reported by the DGAM here. DGAM reports from July 2 2015 that ISIS destroyed some smuggled statues from Palmyra after seizing them in the city of Manbij, close to Aleppo, picked up by Halab News and Paul Barford. Lastly, the DGAM reported on 21 June that IS are laying mines in areas of Palmyra, although Paul Barford has pointed out that this may have a silver lining, as it could prevent fighting occuring in the ruins if the government try and retake the site. This could become very important – According to the International Business Times (10 July), and Reuters, the Syrian army is ready to attack Palmyra. According to the Facebook group Palmyra News Updates on 16 July, IS released several photos of the Citadel at Palmyra showing it unharmed, available here. A tunnel bomb brought down part of the ancient citadel wall of Aleppo on Sunday July 12 2015, according to Reuters, and the BBC. It is not clear who was responsible. A video by the Association for the Protection of Syrian Archaeology on 3 July 2015 shows the damage to the Hammam al-almaji, Bab Al-Naser, part of Aleppo World Heritage Site. A second video by the Association for the Protection of Syrian Archaeology on 1 July 2015 shows the damage to the Altunbugha Mosque, part of Aleppo World Heritage Site. The DGAM have released two updates on damage to Bosra on July 9 and on July 14. 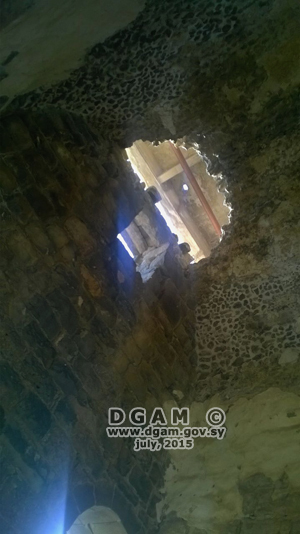 In addition the mosque at Maaraba, near Bostra (Bosra), was damaged in recent fighting, according to the DGAM on July 15 2015. The DGAM has provided updates on other damage at Maaraba on July 20 2015. According to Syria 360, ISIS have laid mines along the Syrian-Turkish border near Karkamis city in Gaziantep. It is unknown whether this included the outer town of the ancient tell of Carchemish, which is on the Syrian side of the border. 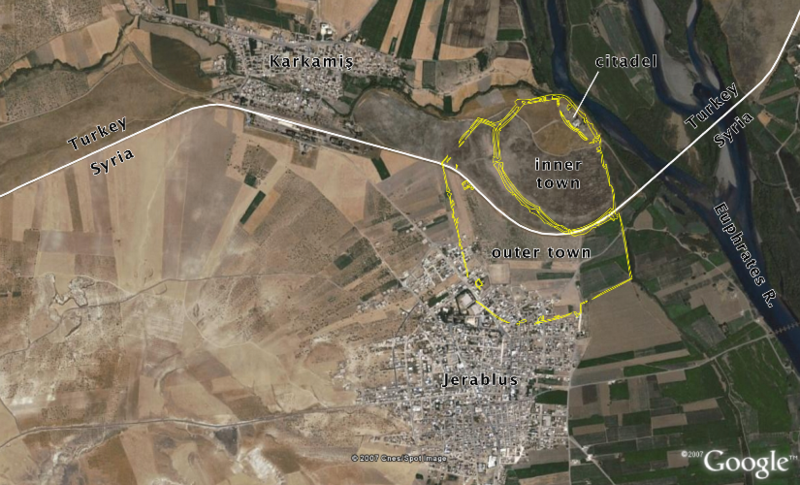 This blog post by BiblePlaces.com accurately reproduces Woolley’s early excavation map of Carchemish and its outer town on Google Earth, and shows Karkamis, and the Syrian-Turkish border. It also describes how the mines from the 1950s on the Turkish side were only recently cleared. On 3 July 2015 the DGAM reported that the museum at Daraa had received minor damage. 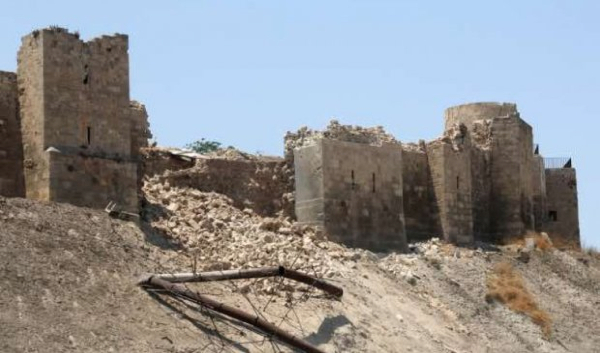 On 12 June 2015, the DGAM reported damage to the al-Ashaari watermill near Deraa. On June 15 the famous mosaic museum in Maarat al-Nu’man was severely damaged by barrel bombs. The attack has been condemned by UNESCO. Reports were published by the DGAM, and by the Association for the Protection of Syrian Archaeology. A detailed report by UNOSAT analysing satellite imagery covering older damage to the town of Maarat al-Nu’man is available here. The Association for the Protection of Syrian Archaeology has released a picture of a permit, possibly issued by ISIS, to allow excavation on behalf of their ‘Ministry of Antiquities’. There has been a great deal of discussion about the Syrian and Iraqi artefacts (including some fakes), recovered in the aftermath of the US Special Forces raids in eastern Syria on May 15 2015. Some of the most detailed are the posts by Sam Hardy on his Conflict Antiquities blog here and here, and the the statement from the US Bureau of Educational and Cultural Affairs. This may be the first material proof that IS are trafficking antiquities. In addition, Conflict Antiquities has written an interesting blog post investigating transit routes and forgeries, and has also identified some of the possible mechanisms by which ISIS conduct their work, identifying a book that was seized in the raid (details here and here). Swedish police are investigating the appearance of looted artefacts from Syria in Sweden, according to the International Business Times. An investigation by UCL archaeologist, Mark Altaweel, for the Guardian on July 3 2015, argued that looted Syrian artefacts are being sold in the UK. Bloomberg, on June 28 2015, reported that IS is increasingly selling art online to compensate for cuts to its revenue flows caused by coalition airstrikes on oil infrastructure. In fact, according to the DGAM, they have recovered 65 000 artefacts so far (14 July 2015)! The BBC has reported here on how war is threatening wine-making in Syria, affecting Syira’s only commerical winery. The group counts Bosra — a former capital of the Roman province of Arabia and a UNESCO World Heritage Site in southern Syria — among its successes. The association helped coordinate a cease-fire between the rebels and the Syrian government, saving ancient ruins that included a well-preserved second-century Roman theater. Under the deal, rebel groups withdrew from ancient parts of the city, and Syrian forces pledged not to shell the area. A month later, archaeologists were restoring parts of the damaged site, and a local militia took responsibility for protecting it from looters. Iran and Syria signed a Memorandum of Understanding (MoU) on 22 June on cooperation in domestic security, and the fight against terrorism and its financing. The MoU also calls for cooperation aginst the stealing of antiquities. A future meeting is planned to include Iraq. Details are available here. When discussing how to combat the illicit trade, members of the European Parliament stated “there are the legal conditions to consider … the possibility of involving UN blue helmets in this area”. Heritage for Peace would welcome the employment of soldiers under a UN peacekeeping mandate with an additional task in the designated area to protect cultural heritage, and curb the illicit trade in artefacts as well as the illegal digging of artefacts. These actions would be much like the CIMIC or Civil Affairs heritage tasks in armies from countries like the USA, Austria or the Netherlands. Recorded sessions of the World Heritage Committee, discussing Syria’s sites on the World Heritage in Danger list, are available here. The 2015 State Party State of Conservation report for all 6 sites can be accessed from any UNESCO Syrian World Heritage site page. The link here is for Palmyra, and the report for all sites is the penultimate link in the list. UNESCO will use satellites to keep track of damage of sites in Syria and Iraq, reports The Guardian on July 1 2015. UNESCO launched the Global Coalition Unite for Heritage Campaign on June 30 2015, designed to face the assault on cultural heritage head-on, as detailed here and here. UNESCO DG Irina Bokova lectured at Chatham House on July 1 2015 on “Cultural Heritage: Extremism’s New Target”, followed by an expert panel discussing the issue. The UK government announced on June 20 2015 that it would ratify the 1954 Hague Convention for the Protection of Cultural Property in Armed Conflict, designed to protect antiquities in war zones. The UK is the only permanent member of the UN Security Council who has not done so. As part of the ratification, Britain will create a fund to help with the recovery of monuments at risk from destruction and looting by Islamic State. There will also be a summit in September to co-ordinate responses to the threat to ancient sites in Iraq and Syria, including Palmyra. ASOR and AIA have issued a joint statement concerning the American law HR 1493, on the protection of “international cultural property at risk” . 5–7 October 2015, University of Cambridge, Cambridge, UK. Details can be found here. ICOMOS and CyArk partnered on 30 June for a workshop on how to protect sites in Syria and Iraq: Emergency Recording and Archiving of Cultural Heritage in High Risk Zones. Details available here. A German workshop was held on Friday 3rd July: “War against civilization. Does the sale of antiques promote international terrorism?” Details available (in German) here. Possibly related (please bear with us while we work on translations), a new German research project called ILLICID will focus and research about the illegal trade with cultural artefacts for the next 3 years. It is a national (German) project by various instutions (Frauenhofer Insitut for Secure Information Technology, Stiftung Preußischer Kulturbesitz, Leibnitz Instutute for Social Science…). ILLICID stands for “Verfahren zur Erhellung des Dunkelfeldes als Grundlage für Kriminalitätsbekämpfung und -prävention am Beispiel antiker Kulturgüter”. In a pilot study they are going to determine an efficient proceeding and instruments for inquiry, documentation and analysis of informations about illegal trade of cultural goods (especially from the Middle East because of the latest events) in Germany. Details are available here. (With thanks to A Polzer). “Strategies for Restoration and Reconstruction: Museums, Heritage Sites and Archaeological Parks in Post-War Countries” was held in Bern on 25 June. Despite the broad title, there was a strong focus on Syria. Their programme can be seen here. The Antiquities Coalition launched a new series, “Culture Under Threat: Terrorism and Profiteering”, on June 23 2015. Details are available here. “The Center for Conflict, Negotiation and Recovery’s Aleppo Project (Central European University) aims to address three issues: How can donors better help those trying to survive in the midst of destruction and how can that aid help rebuild communities as well as cities? How can refugees maintain a voice in what happens to their cities while balancing the need to redevelop healthier communities? What can we learn from the recent reconstruction of cities such as Beirut, Kabul and Sarajevo? In response to the recent destruction of ancient treasures and historical sites in Syria and Iraq, Yale’s Institute for the Preservation of Cultural Heritage (IPCH) and the Victoria and Albert Museum, London (V&A) organized a one-day conference titled “Culture in Crisis” under UNESCO patronage. The conference brought together conservation and preservation experts, museum directors and curators, scholars, and representatives from ministries, national conservation authorities, foundations, and cultural consortiums from across Europe, the Middle East, Africa, and the United States. Talks are available online here. The declaration from the Culture on Crisis conference, signed by all participants, is available here. Facebook has removed pages facilitating the sale of looted antiquities for IS, according to The Daily Mail (June 12 2015). The show will focus on what happens after the disappearance – how artists and scholars express their love and need for the vanished objects through the creation of artworks that react to or refer to the objects, through the painstaking reconstruction of the objects, or through fights to repatriate objects taken from one culture and tantalizingly displayed, out of reach, in another country. According to an interview in the Express, the British Museum has taken steps to protect its artefacts from possible extremist attacks. The Committee for Shared Culture (CSC) are a group of like-minded people who have come together to track down and recover the ancient artefacts that are – they fear – disappearing from archaeological sites throughout Iraq and Syria every day. An anonymous spokesperson for the group was interviewed in the National. According to an interview in the BBC, Archaeologist Roger Michel and his team from the Institute of Digital Archaeology – a joint venture between Harvard University and the Classics Conclave – is hoping to flood areass including Syria with 3D cameras and enlist local partners to photograph as many items of historical interest as they can. They have partnered with New York University’s Institute for the Study of the Ancient World to store the 3D images, and with Massachusetts Institute of Technology Three Dimensional Printing Laboratory to print them. Article by Dr. Graciela Gestoso Singer that describes the ISIS’s war on cultural heritage and memory; analyzes the challenges for cultural heritage conservation in Iraq and Syria, and shows important measures for safeguarding cultural property from the Islamic State’s swath of destruction across the Middle East, available here. Ross Burns on 2 July 2015 has updated his Monuments of Syria site with a July 2015 report on current damage, available here. Conflict Antiquities discusses the destruction of tombs in Syria under Islamic State, in this blog post. The New York Times considers IS’ use of archaeological sites on July 1 2015. The National calls for a Syrian ‘museum in exile’, on June 24 2015. The New Yorker, on July 20 2015, offers an ancient perspective on the current situation at Palmyra, in this very popular article. Al Jazeera, on July 12 2015, discusses ‘the future of ancient sites in the Middle East’. Illicit Cultural Property Blog, on June 29 2015, considers that ‘short of military intervention there really is not much that can be done to dissuade those bent on erasing heritage’. ‘Global momentum’ gathers against ‘cultural cleansing’, reports the World Post on June 17 2015. Can 3D printing help combat the loss of heritage? asks Motherboard. Derek Fincham writes of “Palmyra as Propaganda Success” on June 22 2015 in his Illicit Cultural Property blog, as does this Conflict Antiquities post. Reuters addresses “Blood antiquities” on June 10, 2015.